4ad is a British independent record label that began in 1979. Its former and current artists include the Pixies, Lush, The National, Bauhaus and Pale Saints. If that's not enough, the website is full of video, streams and downloads of their latest music from the homepage and flexible navigation including a prominent search box and a right-panel rolodex style for finding artists alphabetically and chronologically. 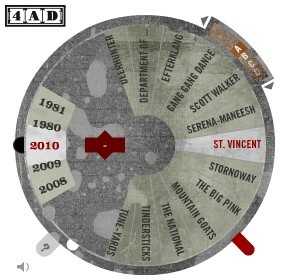 There is also an interactive wheel used to search by artist or year. However, some components of the wheel are unclear and not useful. Without any instruction, the wheel immediately suggests (by changing the mouse pointer from arrow to hand) that you can click and drag to a particular year or an artist; a corresponding white (or black handle) lets the user find specific information efficiently while a red handle (the 'Randomise Leaver') selects random artists from their catalogue. But the purpose of the red rectangle that contains some sort of number is not clear and the ABCD control (allowing you to go a letter page) on the top continually gave me 'no entry' when I used it. Come to think of it, I wouldn't find either function useful when searching for music. Although the quick link to Wheel Help is visible, 4ad could improve the already good user experience of the wheel by simply removing the unnecessary components. This use of functional minimalism would make the wheel less complicated while not compromising its core functionality - finding great 4ad music.